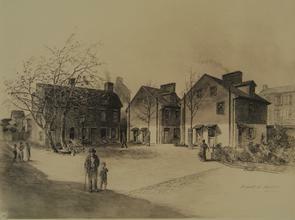 George Mifflin Houses and Workman's Court at Front and Pemberton Streets, built by the Octavia Hill Association; illustration by Frank Taylor; 1914; from Everchanging Philadelphia (a book of illustrations), published by Frank Hamilton Taylor. Illustration of three 2-story homes with people standing around in the courtyard that fills the space between them. "Everchanging Philadelphia, A Book of illustrations," F.H. Taylor, 1915.